The TCPA is a non-profit 501c3 voluntary organization that is responsible for coordinating public access to the cemetery, conducting preservation activities and doing research and advocacy for the cemetery. The property is owned by the Cathedral Basilica of St Augustine and was the parish cemetery from the time of the cathedral's building in 1793 until 1884, when all cemeteries in St Augustine were closed by the city for health reasons. While the Cathedral has always provided basic maintenance, it was clear that there was additional preservation needs. In 2008, researcher Matthew R. Kear spent most of a year studying and documenting the cemetery for his 2009 Cornell University thesis, In Reverence: A Plan for the Preservation of Tolomato Cemetery. It was his suggestion to create the TCPA to deal with the interpretation and preservation of the site. With his help, advice from similar organizations and the archaeological community in St Augustine, and with the support of the Cathedral Basilica of St Augustine, the TCPA became reality on August 28, 2010. Since then, the TCPA has been working to preserve and protect the site and to interpret its rich history to the public. Association members will participate in this activity, working on preservation projects, guiding visitors through the site and assisting researchers in examining this virtual time-line of St. Augustine history. 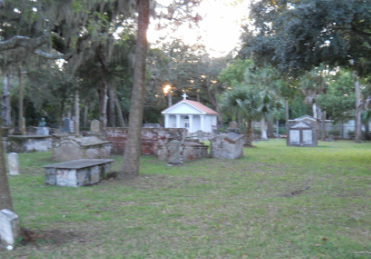 The goal of the Association is to provide regular access to the Cemetery to introduce visitors to this fascinating part of St. Augustine’s past and to make the Cemetery an even more beautiful part of modern St. Augustine.